Oscar Mayer's earworm of a jingle likely convinced entire generations of children that being an Oscar Mayer wiener was the height of personal accomplishment, which is, well, not only misleading but also really confusing? 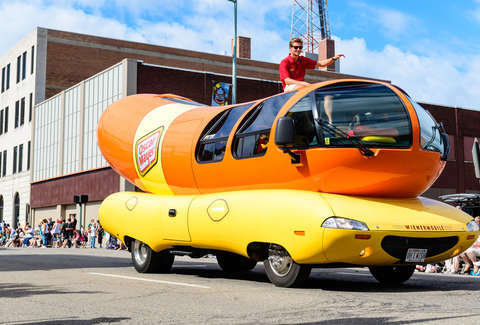 However, if you've always held onto the dream of at least working out of the Weinermobile some day, now's your chance to make it happen because the company is currently on the hunt for new brand ambassadors to travel the country in the iconic hot dog-shaped vehicle. Right now, the folks at Oscar Mayer are accepting applications from people aspiring to be a "Hotdogger," or part of its mobile team of brand ambassadors who travel the country in the Weinermobile, spreading the good word about its processed meat products. The gig, which involves "100% travel," is described as a brand ambassadorship where the a chosen candidate will represent Oscar Mayer in things like radio and television appearances, newspaper interviews, grocery store and military appearances, and charity functions. Essentially, you'd be getting paid to run a mobile public relations firm out of the hot dog-shaped set of wheels for a year, starting in June. While you'd presumably have access to all the Oscar Mayer snacks you could ever want, you'll also be set up with a special uniform, and earn an undisclosed "competitive" salary, plus benefits. That's on top of whatever reward you'll feel by enchanting the kids and adults alike who once dreamed of manning the Wienermobile themselves. If you're serious about throwing your hat in the ring, the company is accepting applications until January 31. To make the cut you just need to have a BA or BS (ideally in a discipline like public relations, journalism, marketing, advertising or communications). Also, if you speak Spanish, that may give you a leg-up. Presumably, though, a well-articulated passion for OM's processed meat and novelty road-legal vehicles may be all you need to land yourself a spot criss-crossing the country in a hot dog-shaped bus later this year.